Like most people, most weekends I tend to enjoy having a light and simple brunch at home. It could be having some simple savory tarts, pizza, pasta, or just a couple of spring rolls with my kids. 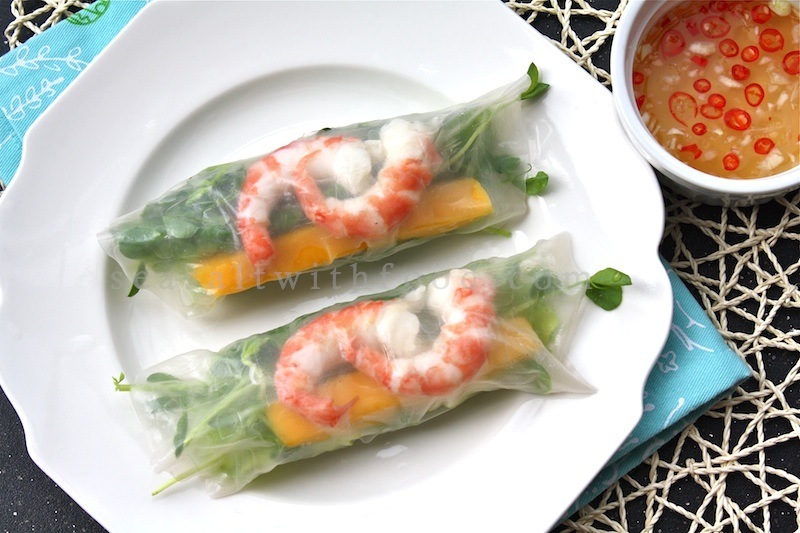 This past weekend, I made my version of Mango With BC Spot Prawns Spring Rolls for brunch. Both the mango and Spot prawns are in season now, so they are very fresh and well priced. I served the spring rolls with some Vietnamese chili lime sauce. Simply divine! Chili Lime Sauce: In a small bowl, combine warm water and sugar. Stir until the sugar dissolved. Then mix in the chilies, garlic, lime juice and fish sauce. To make the spring rolls, soften a rice paper by dipping into a pan of water for a few seconds. Lay flat and pat dry with a damp cloth. The rice paper will soften in about 15 seconds. 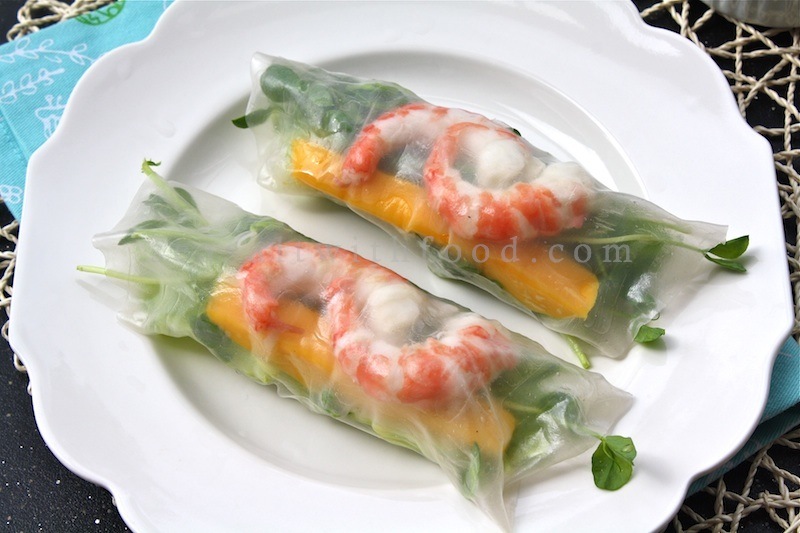 Place 2 prawns in the middle of the prepared rice paper, follow by mango, pea shoots, mint leaves, basil and top with lettuce leaves. Bring one end of the sheet and roll up over the filling and press gently to compact. Serve immediately with the chili lime sauce. The tranparent wrappings made the dish looks very special and delicious! fantastic... i'd love to try it..
those look really beautiful....I have never seen anything like it....really great!! Are there other herbs you recommend with this? @Salanth: Try Arugula (Rocket), not herb but Arugula leaf is peppery and aromatic. These look really great! I think these are called summer rolls though because spring rolls are deep fried and very similar to egg rolls. 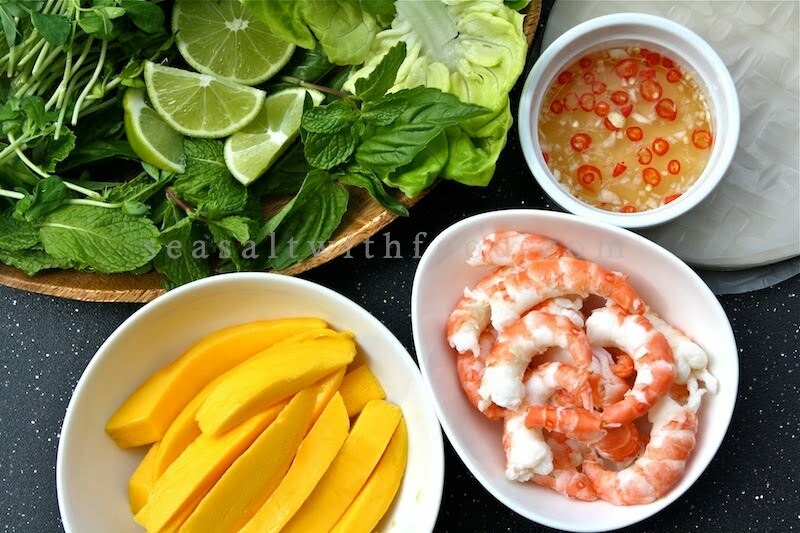 @yummynomnoms : Yes, you call them summer, fresh or just spring rolls. Thanks. I would love to have this for dinner. By the way, I would like to invite you to join and have your say about food and anything on this new Food and Nutrition Forum. You can even win the cash prize for the most number of referrals.See you there! Thanks. i've never seen the addition of mango! what an AWESOME idea!! !